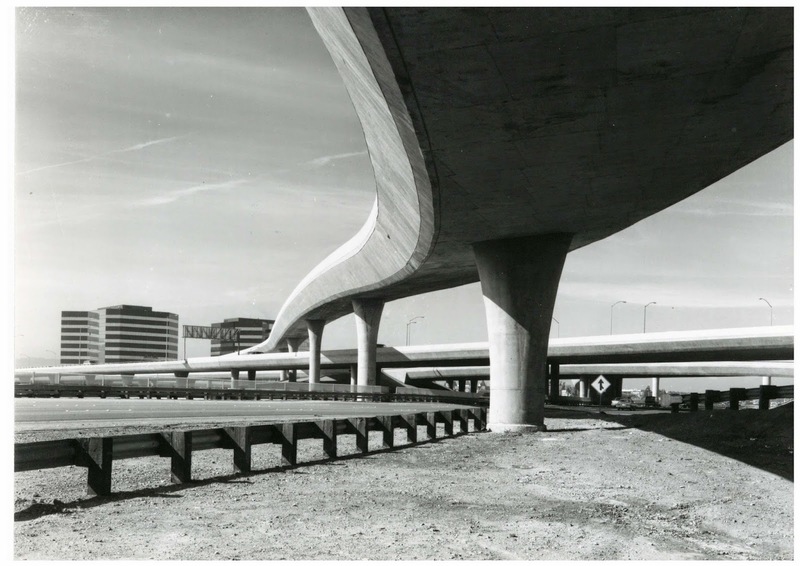 The Route 92/101 Interchange was begun in 1971 but it wasn't completed until 1986 due to a lack of funding for highway projects during the first Jerry Brown administration. He was very idealistic in those days and wanted to change the way people traveled. The interchange carries traffic onto the San Mateo Bridge to the west and onto Route 101 and San Francisco to the north. The Northwest Connector (shown above) consists of three frames (600', 700', 450') supported on single column bents.The superstructure is a prestressed concrete box with two vertical, interior girders and two sloping exterior girders. This bridge has a long swooping shape that reminds me of a brontosaurus. San Mateo County, California Bridges: Northwest Connector of the Route 92/101 Interchange by Mark Yashinsky is licensed under a Creative Commons Attribution-NonCommercial-NoDerivatives 4.0 International License.